This sweet & spicy brussels sprouts are gorgeous little bundles of goodness and flavors. It's Asian inspired & super hearty for your low carb or keto diet. Whisk together your sweet and spicy sauce ingredients (the first 5 listed) and set aside. 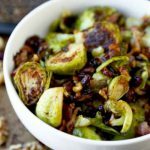 Trim and quarter your brussels sprouts (quartering decreases the cook time!) and let them cook about 5 minutes on each side in a large wok. Try to let them cook on their flat sides for a while before tossing them. In the last 2 minutes of cooking, pour your sauce in and toss to coat thoroughly. Serve with a sprinkle of sesame seeds and green onion. Add a touch of pink sea salt to taste.